On 5 February 1999, Janey, an ex-colleague, forwarded me “Can U do a P4 maths question?”. A farmer has twice as many ducks as chickens. After the farmer has sold 413 ducks and 19 chickens died, he has half as many ducks as chickens. How many ducks does he have now? The above primary four (or grade four) question seemed to have been originated from an educated parent or university lecturer, who lamented that he was unable to solve it without algebra. How do you find the answer without having to solve an algebraic equation? Before reading on, switch off your algebraic antenna for a while, and try to solve the question, using a model. To novice problem solvers, or to those whom the model method is a foreign heuristic, the thinking processes involved in drawing the correct model is seldom obvious. Even if you’re versed with the model or bar method, your model may be different from the one provided by the problem solver. With some effort, one can come up with no fewer than half a dozen methods of solution. Other than the Chinese line and the Japanese Sakamoto methods, here are three commonly known ones, the first one being a slightly modified version of the above. So the number of ducks the farmer has now is 125. In many problem solving books published locally, where the model method is the primary heuristic, few writers had provided more than one method of solution. Whether it’s due to space or time constraint from the editorial side, or because of little or no conscious effort on the part of the problem poser, to look out for alternative models, is hard to tell, especially when not many who edited or wrote those questions had had first-hand classroom experience with students who struggled with constructing those models. It isn’t uncommon to encounter these typical questions in the Singapore Mathematics Olympiad for Primary Schools, and from the exam papers of the better local primary schools, whereby a model solution, or some intuitive method, is expected. 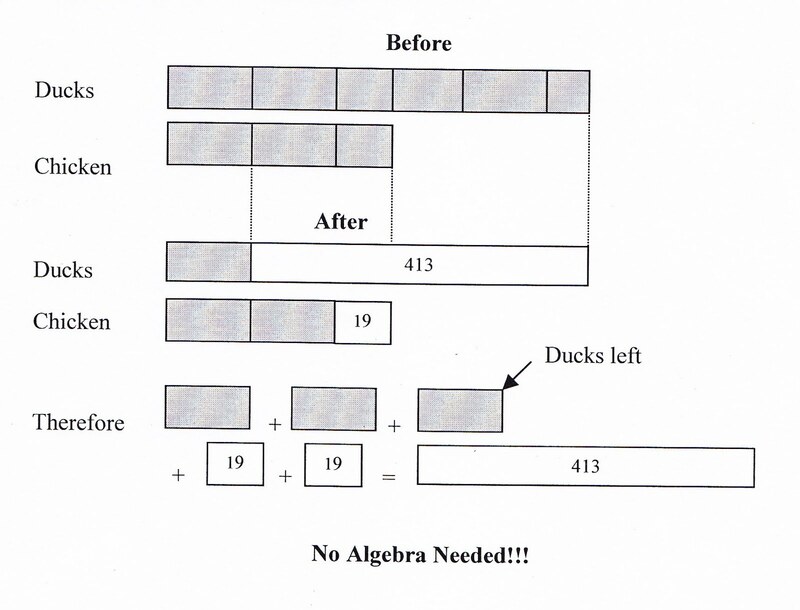 Such problems, which would normally be solved by algebraic means at a higher level, could now be tackled using a model, when set at a lower level. We fail to realize that these challenging questions are often constructed backwards, so that we can force the numbers to fit themselves nicely at each step of the working. 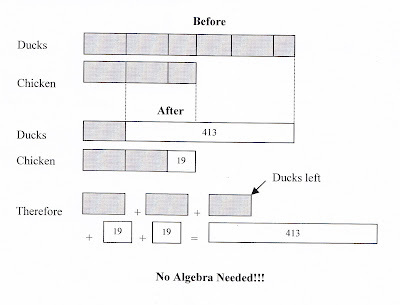 No wonder even experienced primary and secondary school (elementary and middle-school) teachers are challenged to solve these word problems sans algebra. Failure to be aware of this may otherwise lead many qualified teachers to feel inadequate in tackling these non-routine questions, especially when a non-algebraic solution is expected. The disturbing fact about using the model method is that many schools (not just the better ones) in Singapore use these “Section C Problems” to unfairly identify and stream students into the good and bad classes⎯the A-, B- and C-band and the rest, where the students are presumably less academically inclined. So if you can’t cope with (or are allergic to) those word problems whose solutions are best solved using a model, then good luck to you! Your score on these word problems is often used to gauge how good you are in mathematics. The worst happens when teachers themselves aren’t confident in solving these word problems. What they usually do is to leave confused students with some sketchy modeled steps, often worked out by underpaid undergrads, as hints or partial solutions to questions that are extracted from unauthorized (pirated?) exam papers.